This is American Omens as I see it. The premise is the future persecuted Christian faith. I personalized it and tried to create a unique story told in my unique way. First and foremost, like all of my flawed works of fiction, I put myself in the pages. Many times, this is not the hero but a minor character who can be majorly annoying. Thankfully, editors can help problematic issues. In this case, a throwaway role became a pivotal part. Works of fiction can be like journals, documenting where I’m coming from as I write them. Sky Blue was written from a burnt-out soul skeptical of publishing. Isolation came from a heart that was angry with God (and didn’t recognize it until years later). The Promise Remains is from a young heart hopeful of everything. Midnight (finished but unpublished as of now) documents emotions throughout five difficult years. Readers don’t want meandering and melancholy ramblings. They want characters to root for and mysteries to dissect and journeys to take. Mark my words. American Omens has those characters and mysteries. It also has a big, beating heart in its center. The three main characters we follow include a twenty-something brilliant computer algorithms architect who is searching for her father. Literally and figuratively. Then there’s a ruthless FBI assassin with a mission who’s own life is circling downward. And finally there’s the family man forced to close his bookstore and find a new purpose in life. The backstory I’ve created is massive, and the only comparison I can make to anything else I’ve had published is with The Solitary Tales. This is being published as a stand-alone title, and it works just like that. Unlike Solitary, for instance, you can read American Omens and know that it has a complete story arc. But I’ve also set things in motion in this story because I have an entire series planned. 3 books? 12 books? Sure. It could be either of those. I’ve taken inspiration from some of my all-time beloved novels and movies and woven them into the fabric of American Omens. Will you see the threads? Not necessarily. It just worked for this story, especially since it’s a futuristic tale set twenty years from now. There’s one particular storyline and character that I’ve wanted to write about that is finally making it onto page. Other inspiration? Again, it comes from the man writing this. Faith isn’t a backdrop; Christianity is front and center in this book. My personal walk with the Lord can been seen in a variety of ways. I attempt to look through the eyes of someone struggling with their faith, someone searching for what faith looks like, and someone complete devoid of faith. Other influences come in unlikely ways, including the very big impact my father has had on this novel. I’ve spent many hours researching technology and the advancements being made in all sorts of areas. Algorithms are something I’ve studied quite intensely, and honestly, the more I know the more terrified I become. Just like with my characters, I’m trying to get the futuristic technology in American Omens as accurate as it can be. 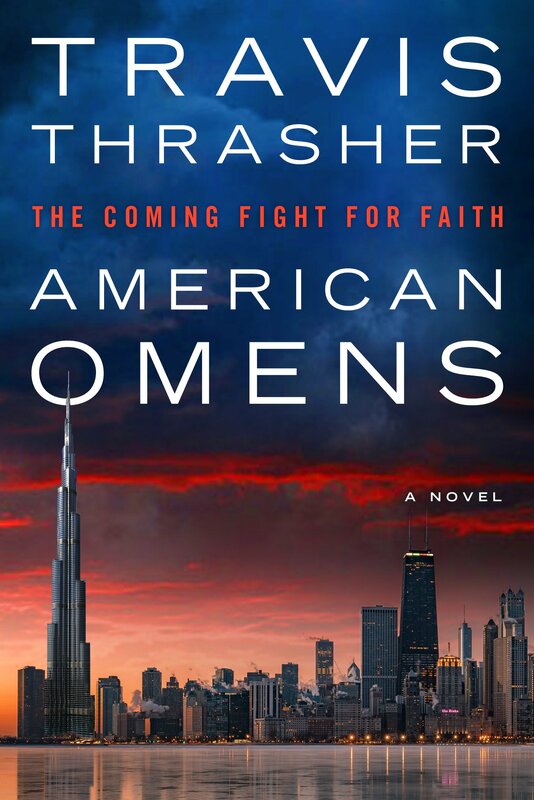 American Omens doesn’t easily fit into any genre box. I’m not trying to make it read like one particular author or one type of fiction. It’s distinctly a Travis Thrasher novel, one that intrigues and occasionally baffles you, but also one that hopefully moves you at its end. This is going to be a book I’m going to be urging people to BUY. I haven’t been obnoxious about a title of mine for a while. But not only do I consider American Omens quite a special read, but I also know the only way to continue its story is to have the sales to justify it. Well, actually, that’s not quite true. It can continue regardless of sales. But I’d love to make the process a lot more easy. To have the hard part simply be the writing itself. But we’ll see. February 12, 2019. Mark your calendars! Lots more to come! !